Tuesday’s ad is for Pabst Blue Ribbon, from 1954. Starting in the early 1950s, Pabst started a new ad campaign with the tagline “What’ll You Have” which lasted for a few years. They were colorful ads, and often had the tagline spelled out in creative ways. Since this is the last day of July, I have several more of these ads, so here’s four of them to finish out the month. In these ads, “What’ll You Have” is written on various objects surrounding different dishes. First, on a salad bowl with skewers, then on the tool for cracking a lobster, around the metal stand for a bowl of stew, and on the wooden carving board with big, thick steak on it. In each ad, there’s also a full glass of beer and a bottle Pabst Blue Ribbon on the table. Today is the 44th birthday of Jonathan Surratt. Jonathan launched the Beer Mapping Project and also runs the website for DRAFT magazine. He also created National Growler Day, though its exact date from year to year is still fluid, and he’s a twitter diva, too. Join me in wishing Jonathan a very happy birthday. Horse Brass publican Don Younger bookended by Jonathan’s wife Robin and Jonathan, displaying his excellent taste in attire. 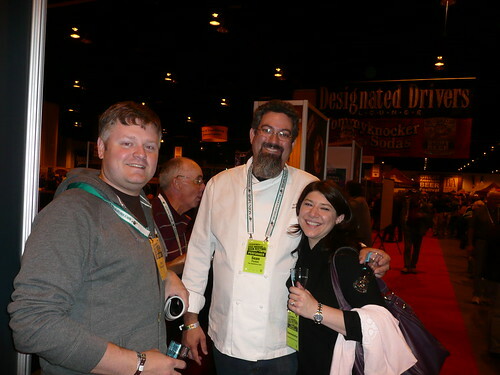 Jonathan with Sean Paxton and Jonathan’s wife Robin at GABF a few years ago. Jonathan, Ray McCoy, Robin, and Ray’s wife, Cornelia Corey. 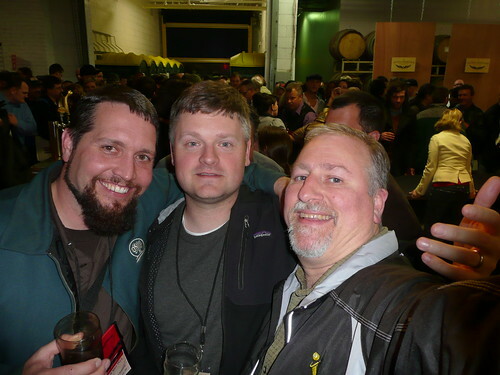 A self-portrait with Matt, from Oakshire Brewing, Jonathan, and me at the Goose Island cask event during CBC in 2010. 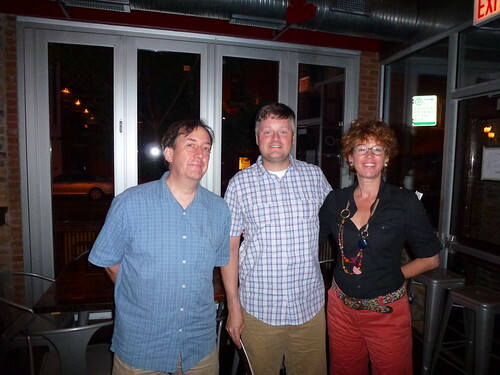 Michael Roper, owner of the Hopleaf, Jonathan, and Wendy Littlefield, from Vanberg & DeWulff, when we had dinner there a few years ago. Monday’s ad is for Pabst Blue Ribbon, from 1954. Starting in the early 1950s, Pabst started a new ad campaign with the tagline “What’ll You Have” which lasted for a few years. They were colorful ads, and often had the tagline spelled out in creative ways. In this ad, “What’ll You Have” is written on the handles of the salad tongs sitting in a shrimp salad. In front of the bowl is a Pabst bottle being poured into a glass. Today is the birthday of Leopold Nathan (July 30, 1864-	December 24, 1937). He was born in Laupheim, in Württemberg, in 1864. 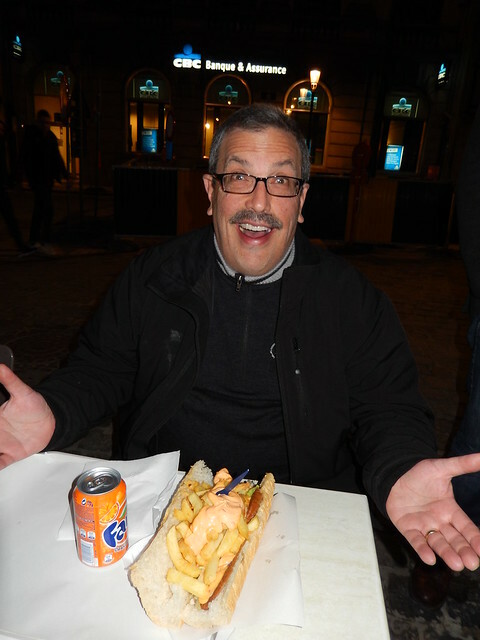 “He studied chemistry in Frankfurt am Main and became a leading expert in wine and beer processing. 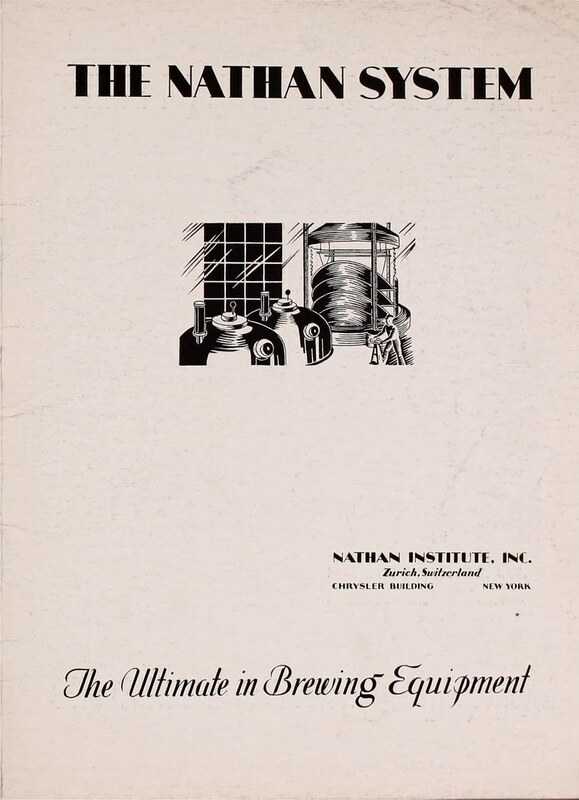 In 1912 he founded the Nathan-Institut, or Nathan-Institute AG.” He developed the Nathan Brewing System, the closed system using conical-cylindrical fermenters that are ubiquitous today. Leopold Nathan (Laupheim, July 30, 1864 – Berlin-Dahlem , December 24, 1937) was a German scientist, brewer and inventor. He was born at Schloss Laupheim. This slot had the disposal of a brewery, so early did not only his interest in fermentation measure that also to nature in general. Due to poor health, after doctoral education he did not go to the gymnasium, but in the doctrine of an uncle, where he could transform his love for flowers and plants into the open air into theoretical knowledge. Before his 18th he studied fruit and wine studies at Geisenheim University College. For some time he had been the assistant of Hermann Müller, better known as Hermann Müller-Thurgau, the breeder of the Müller-Thurgau grape breeder. Nathan dedicated himself to making wine from berries and paid close attention to the yeast types used. In winter of 1888, Nathan again contacted brewing when he studied the yeast reindeer culture for three months in the famous laboratory of the Carlsberg Brewery, where Emil Christian Hansen performed groundbreaking work for the brewing industry. In the years thereafter he made more and more of fermentation, first of berries, later also the preparation of champagne and schaumwein and sekt – the German version of champagne. Nathan develops a new way of producing and riping beer under substantially sterile conditions, the [Nathan_Brouwerij | Nathan System]. Around the turn of the century, Leopold Nathan came to Switzerland, where he would later receive citizenship. In 1912, in Zurich, together with Ing. Gille, Bonenblust and Einstein founded the Nathan Institute. From this institute, the process and components of the brewing facilities are further improved and the commercial activities supported. The chemical department of the Technical University of Munich, Nathan, awarded his title in 1923 the title ‘Doctor ing.’. 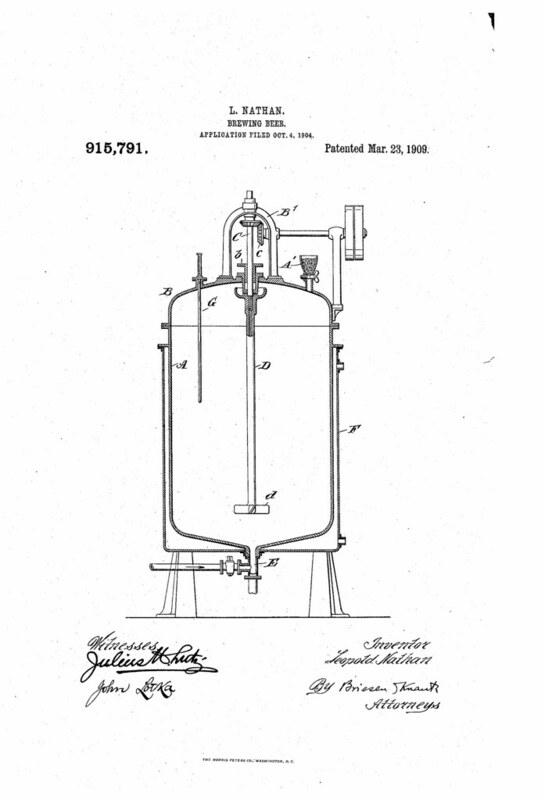 Just a few of his patents, as filed in the U.S., include the Manufacture of vessels (1906), a Process for sterilizing closed vessels (1907), the Art of brewing beer (1918), a Process and apparatus for the filtration of beer wort for further treatment, and for the filtration of beer and other foaming liquids (1930), a Process for the elimination of the immature odoriferous constituents in brewing (1935). 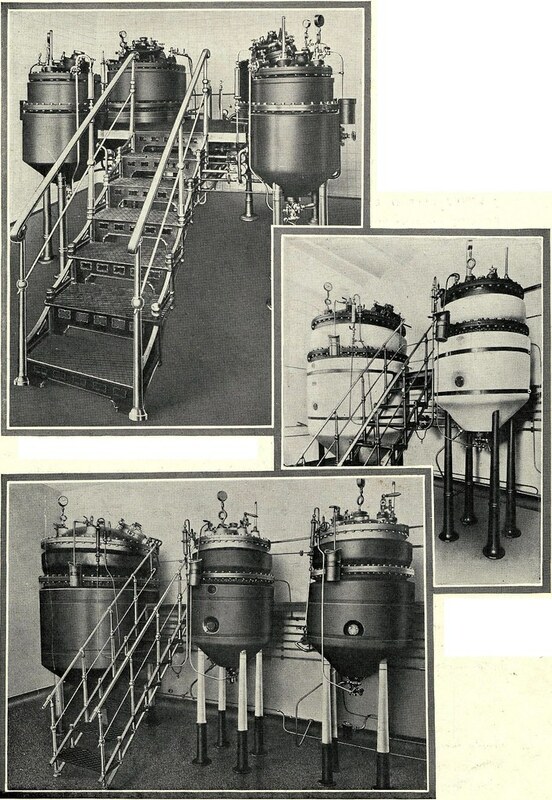 The Walkerville Co-operative Brewing Company Ltd of Adelaide signed an agreement with the Nathan Institute of Zurich in November 1925 for the installation of its plant at the company’s brewery at Southwark, and this became the first Nathan system to be installed in Australia. It was a major project for the brewery, requiring the erection of additional buildings to accommodate the new equipment. Beer production commenced in the Nathan plant late in 1927, and a formal opening ceremony was held in January 1928. 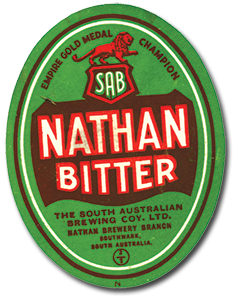 Nathan Bitter was the first beer brewed and was instantly popular, being sold around Australia. The South Australian Brewing Company was becoming the more dominant brewery in the 1930’s and by the end of the decade they had purchased the Walkerville Brewery. 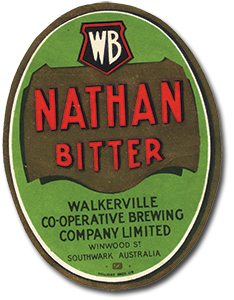 Since the Nathan Beers were so popular they continued to make the beer at the Southwark Brewery, the brewery wanted to remove the Walkerville branding so they renamed the brewery to the Nathan Brewery. Members will have heard with regret of the sudden death of Dr. Leopold Nathan, at Berlin. To many he was personally known through his visit to Edinburgh and London in 1930, when he addressed both Sections. His name stood very high in the brewing world on account of the great technical advances he introduced. These may possibly have overshadowed his scientific attainments, which were of no mean order. Though he lived to the age of 73, he was rather delicate in his youth, but overcame this and developed the remarkable energy which characterised him in later years. He had a varied career. Engaged first at a distillery in Erfurt, he passed on to the study of viniculture and, finally worked under Hanson at Copenhagen. Returning to Germany he was engaged in the preservation of vegetables by drying and drew attention to the possibilities of canning. During this early stage of his career he also worked on the manufacture of fruit juices and was the first to apply pure yeast culture to wines, and was one of the earliest protagonists of the collection of fermentation gas. This work led him to study brewing, and ultimately to the rapid brewing process, with which his name is associated. The object of the Nathan process is to produce a lager beer in much shorter time than is usual. It is based on the principle of pure yeast in sterile wort. In 1900, Nathan moved to Zurich, and in 1912 founded the Nathan Institute and from there directed many installations all over the world. The output of beer brewed by his process now amounts to more than 1,500,000 barrels a year. He drew attention many years ago to the necessity of using air-free CO, and to the advantages of bottling under CO2. The University of Munich recognized the value of his scientific and technical work by conferring on him the honorary degree of doctor. But it’s his brewing system that he invented and improved upon throughout his life that he’s remembered for, so let’s take a look at the Nathan System. In the early twentieth century, in climatic conditions, it was virtually impossible to brew a good beer in areas with a tropical climate. 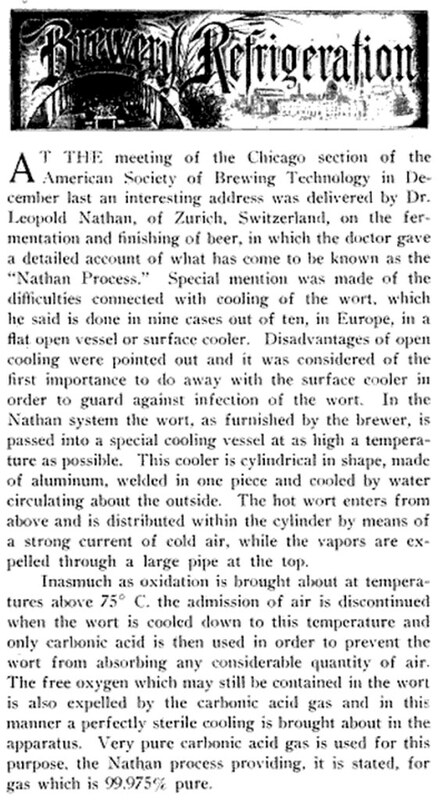 The German but Swiss resident Brewer and inventor Leopold Nathan developed a new type of brewery with a brewing method in that time. The method was aimed at not contacting the wort with direct outdoor air and significantly reducing the bearing time. Several breweries were already in use in Germany who used a Nathan installation and the results were hopeful. During this time, conventional fermenters used conventional breweries, and after a storage period of up to six months, the beer was suitable for consumption. The tight, technically well-equipped interior of a Nathan brewery. As with the classic method, the malt is scraped and mixed with water. This mixture is then heated in steps to convert the starch into sugars during the germination. The next step is filtering out the grain residues and the remaining liquid (the wort) is boiled and hops are added. In this process the wort becomes sterile. With the method of Nathan, the wort is removed in a special barrel of all hop and malt residues and then cooled to 5 ° C as soon as possible by means of a surface cooler. This cooler is located in a space where filtered and sterile air is blown. The chilled wort goes slowly from below into the vessel and is pumped so until the liquid is clear. 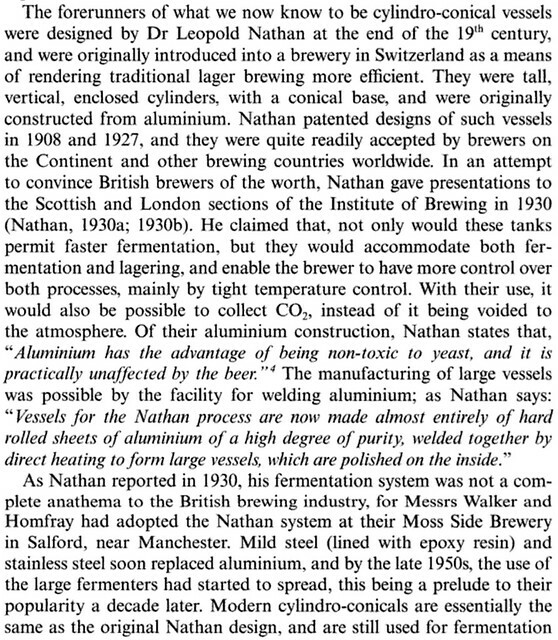 Unlike the usual open fermentation bins, aluminum barrels were used in a Nathan brewery. 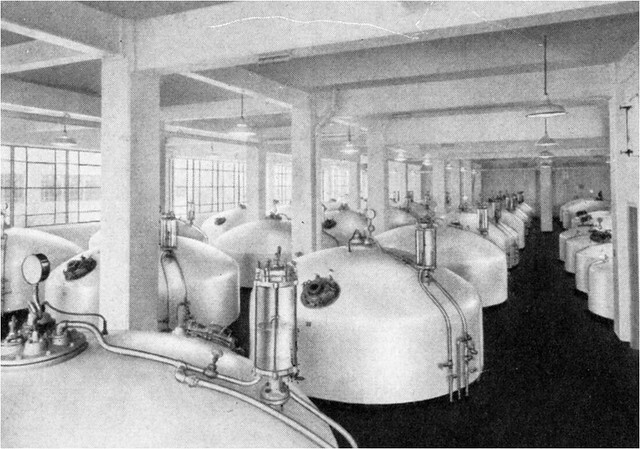 These cylinder conical tanks were an essential part of the Nathan Breweries. 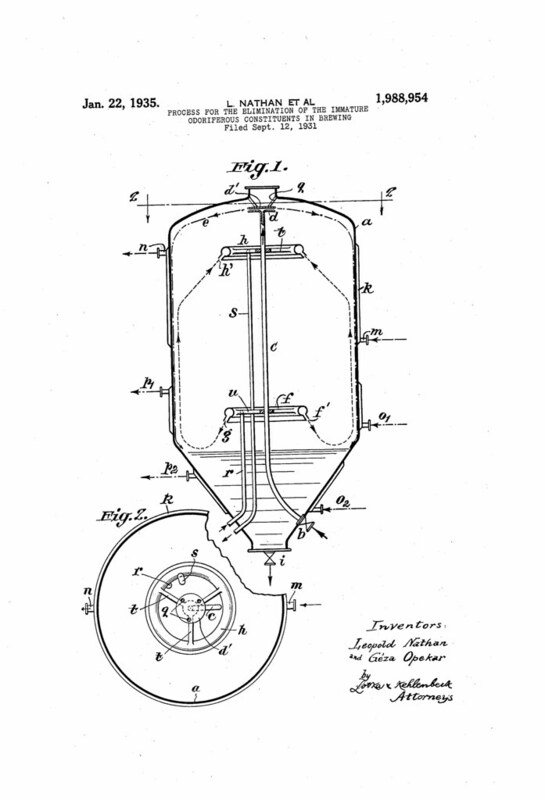 This type of tank was patented by Nathan in 1927 and are still used in many breweries. The tanks were fitted with a jacket that allowed cooling to the right temperature. The yeast – a cultured, clean culture – was added from below and kept in motion by sterile air or carbon dioxide so that the yeast process could be accurately controlled. In six to nine days, depending on the type of beer, the fermentation was completed. Because it was a closed system all carbon dioxide generated at the fermentation could be collected and reused after purification. Before use, the used material was sterilized with alcohol. The Nathan Institute also provided “loose” yeast cultivation plants. Such an installation was placed at the Hürlimann brewery based in Zurich. At this brewery a lot of research was done on yeast and its functioning. Hürlimann brought “Birell” one of the first truly successful alcohol-free beers on the market. The storage that took place in a classic brewery in those days was accelerated in the Nathan method by a few days a lot of small bubbles of carbonated acid (collected at the fermentation) by pumping the young beer. 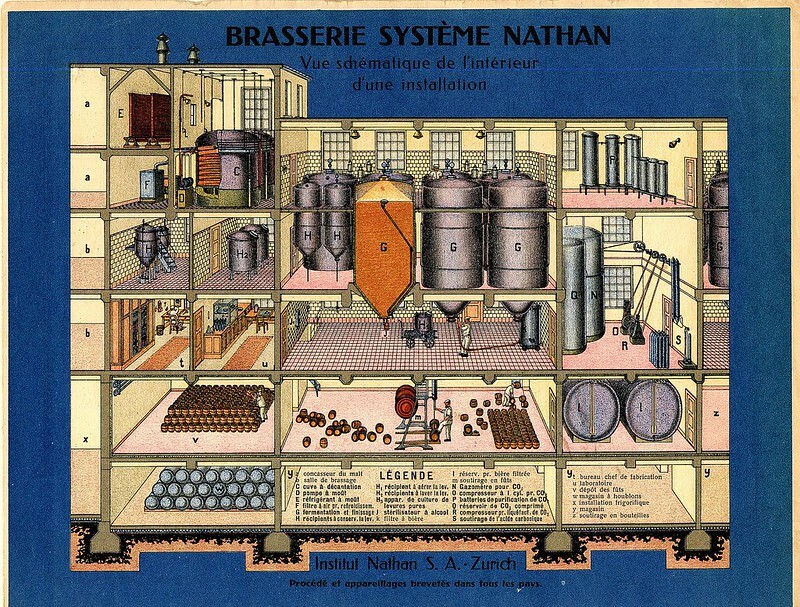 Schematic drawing of a Nathan brewery on the back of a French-language brochure. This is one of his earlier patent. There are also several other online accounts of Leopold Nathan. 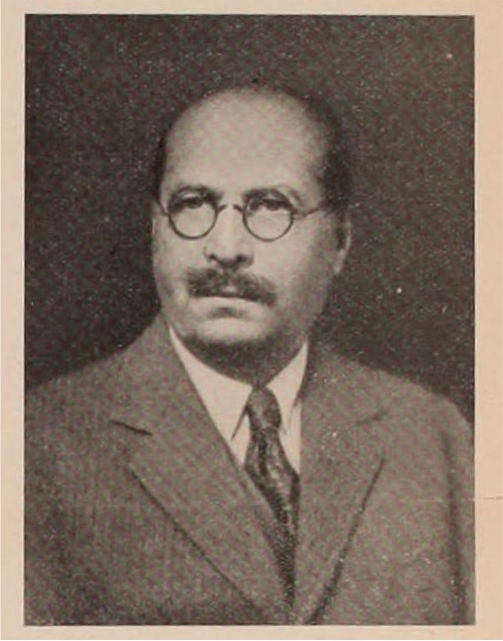 See, for example, Gary Gillman’s two posts, Leopold Nathan – Unsung Hero of Modern Brewing and Some Bio On Dr. Leopold Nathan. Then there’s also Brewing Vessels Reviewed: Cylindroconical fermenters remain a craft beer staple, The Nathan System in Australia, and Improvements in the Fermentation and Maturation of Beers. And this is one of his later patents. Today is the birthday of Hamar Alfred Bass (July 30, 1842-April 8, 1898). He was the great-grandson of William Bass, the founder of the Bass brewery, and the second son of brewer Michael Thomas Bass. Bass was born in Burton upon Trent, the second son of brewer Michael Thomas Bass and his wife Eliza Jane Arden, daughter of Major Samuel Arden of Longcrofts Hall, Stafford. Bass was the great-grandson of William Bass, the founder of the brewery firm of Bass & Co, and his elder brother became Lord Burton. Bass was educated at Harrow School and became a Director of the family firm of Bass, Ratcliff, Gretton and Co. He was Honorary Major of the 4th Prince of Wales’s (North Staffordshire) Regiment and was a J.P. for Staffordshire. Bass played cricket for the Marylebone Cricket Club (MCC), making a single first-class appearance for the MCC against Sussex in 1865. He was dismissed in the MCC’s first-innings by James Lillywhite, while in their second-innings he was dismissed for 3 runs by George Wells. The match ended in a draw. 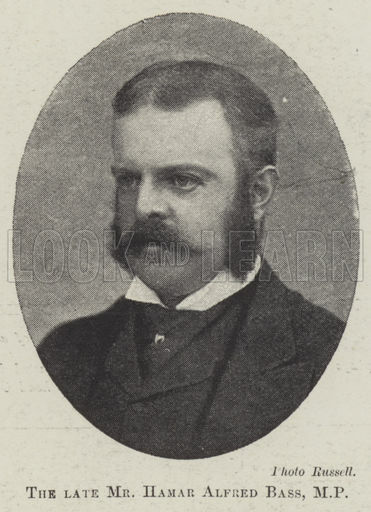 Bass was elected MP for Tamworth at a in by-election in 1878 and held the seat until 1885 when the representation was reduced to one seat under the Redistribution of Seats Act 1885. He was elected MP for West Staffordshire in the 1885 general election and held the seat until his death aged 55 in 1898 from a complex form of rheumatism. Bass was a breeder at the Byrkley Stud and his horse “Love Wisely” won the Ascot Gold Cup in 1896. He was also for 12 years master of the Meynell Hunt. Bass married Louisa Bagot (1853–1942), daughter of William Bagot, 3rd Baron Bagot, in 1879. 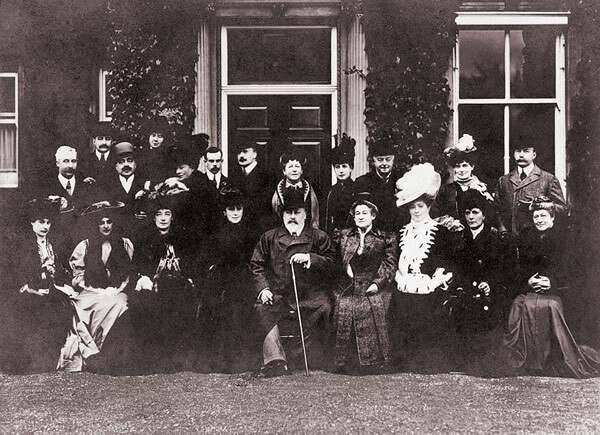 They lived at Byrkley Lodge and Needwood House, Burton, and also at 145 Piccadilly, London. After his death, Louisa married Rev Bernard Shaw. Bass’s sister Emily Bass married Sir William Plowden, MP for Wolverhampton West, and his sister Alice Bass married Sir George Chetwode being the mother of Field Marshal Philip Chetwode. Bass’s son William succeeded in his uncle’s baronetcy according to special remainder. Hamar Bass’s daughter Sibell Lucia married Major Berkeley John Talbot Levett of the Scots Guards, son of Theophilus Levett of Wychnor Park, Staffordshire. Berkeley Levett served as one of the Gentlemen Ushers to the Royal Family from 1919 to 1937. Hamar Bass was the second son of Michael Thomas Bass and his wife Eliza Jane Arden. He was brother of Lord Burton and also a Director of the family firm of Bass, Ratcliff, Gretton and Co. One sister Emily married Sir William Plowden, MP for Wolverhampton West, and the other married Sir George Chetwode being the mother of Field Marshall Philip Chetwode. Hamar Bass was MP for Tamworth from 1878 to 1885. 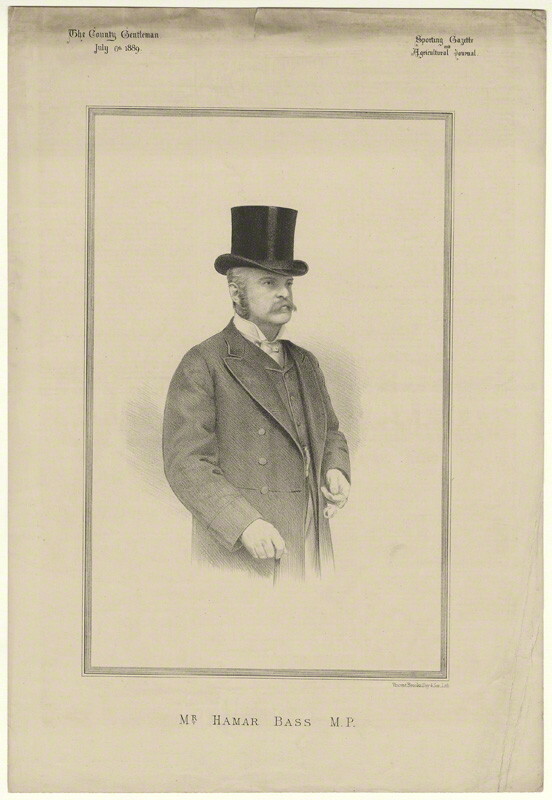 He was then MP for West Staffordshire from 1885 until his death aged 56 in 1898 from a complex form of rheumatism. Hamar Bass married Louisa Bagot (1853-1942), daughter of William Bagot, 3rd Baron Bagot, in 1879. They lived at Byrkley Lodge and Needwood House, Burton, and also at 145 Piccadilly, London. Louisa subsequently married Rev Bernard Shaw. He was a breeder at the Byrkley Stud and his horse “Love Wisely” won the Ascot Gold Cup in 1896. He was also for 12 years master of the Meynell Hunt. His son William succeeded in his uncle’s baronetcy of Stafford according to special remainder. Hamar Bass’s daughter Sibell Lucia married Major Berkeley John Talbot Levett, Scots Guard, son of Theophilus Levett of Wychnor Park, Staffordshire. Berkeley Levett served as one of the Gentlemen Ushers to the Royal Family from 1919 to 1937. 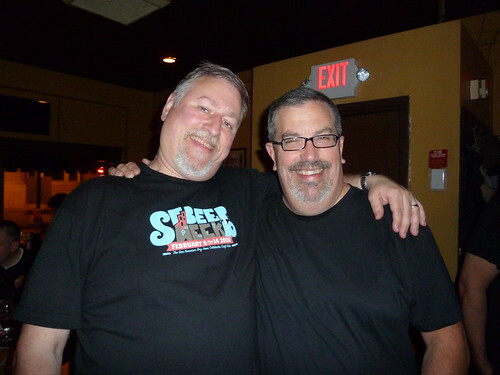 My good friend Tom Peters, one of the owners of Monk’s Cafe and Belgian Beer Emporium in Philadelphia, Pennsylvania, turns 65 today. His enthusiasm for and promotion of Belgian beer has few equals. A couple of years ago, I was privileged to travel through France and Belgium with Tom, which was amazing. And he throws perhaps the best late night parties of anyone I’ve ever known. Join me in wishing Tom a very happy birthday. 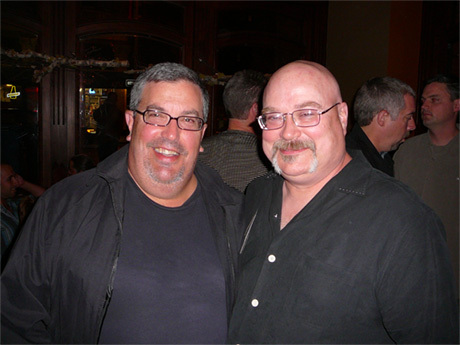 Tom Peters with Dave Keene, owners of the best two Belgian beer bars on both coasts. 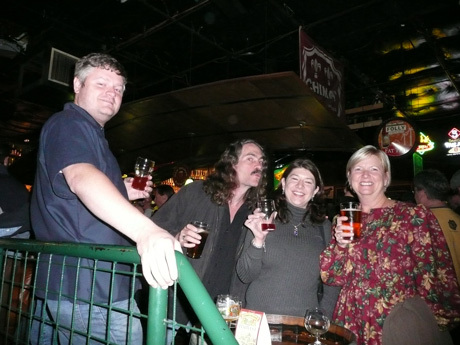 Shaun O’Sullivan from 21st Amendment, Fergie Carey, co-owner of Monk’s, Lucy Saunders, the beer cook, and Tom Peters. 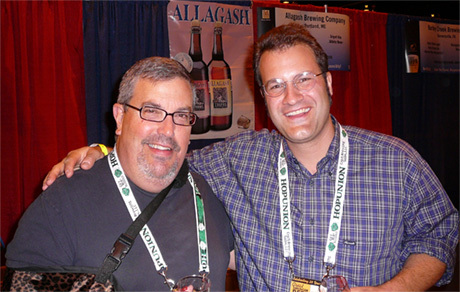 Tom Peters, with Rob Tod from Allagash in Portland, Maine, at GABF. 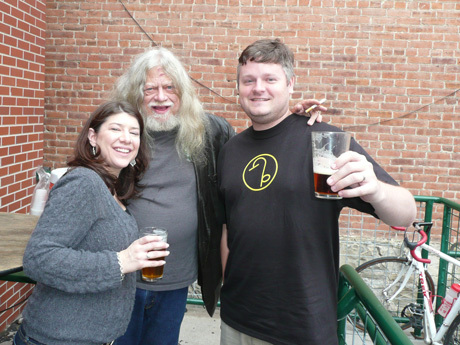 Me and Tom after the Great Lambic Summit at the University of Pennsylvania Museum of Archeology & Anthropology during last year’s Philly Beer Week. 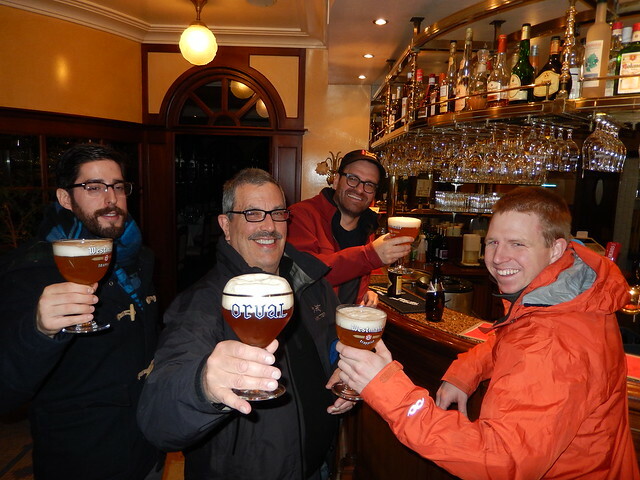 In Belgium, with a perfectly poured Orval, with Daniel Neuner, William Reed and Justin Low. 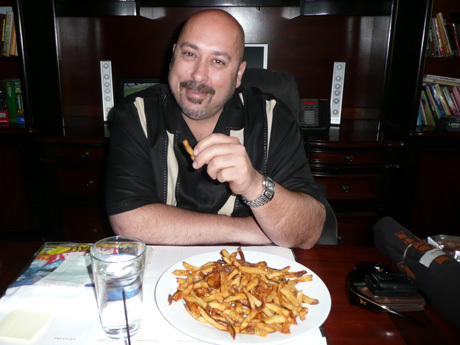 Also in Belgium, with a Fanta and Frites sandwich. 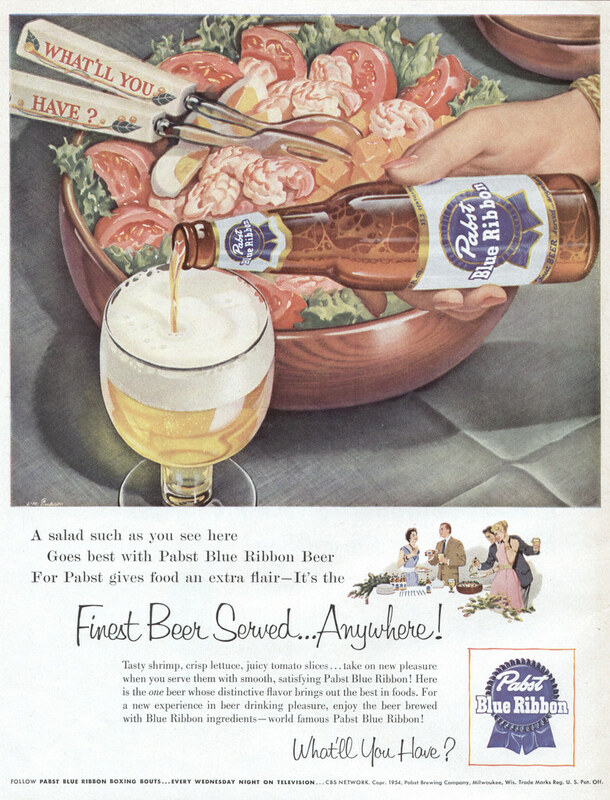 Sunday’s ad is for Pabst Blue Ribbon, from 1952. Starting in the early 1950s, Pabst started a new ad campaign with the tagline “What’ll You Have” which lasted for a few years. They were colorful ads, and often had the tagline spelled out in creative ways. 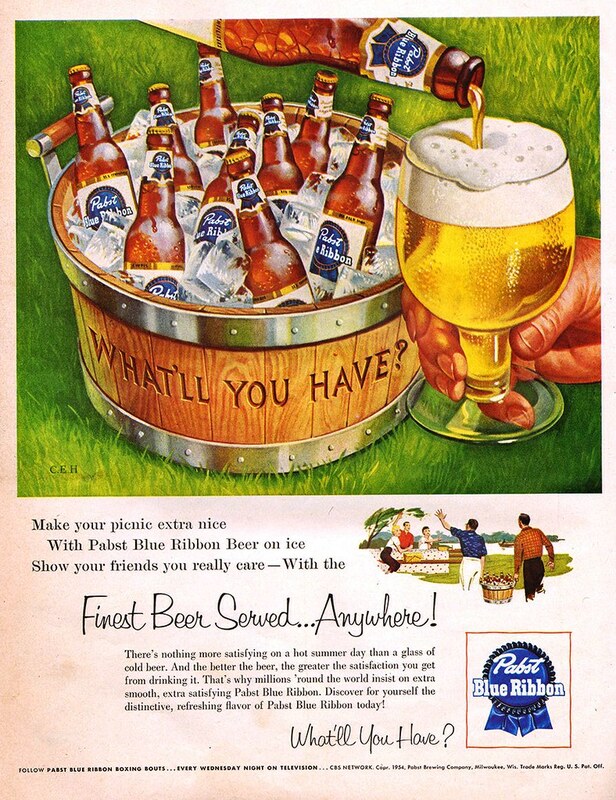 In this ad, “What’ll You Have” is written on a large wooden tub filled with ice and beer bottles. Although one of those Pabst bottles is being poured into a glass. Today is the birthday of Max Schwarz (July 29, 1863-February 7, 1901). 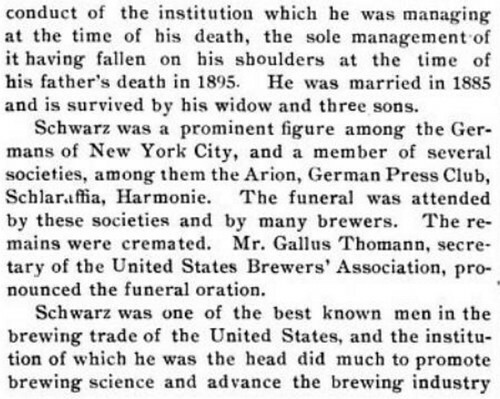 He was the son of Anton Schwarz, who owned the magazine/journal American Brewer, which he turned into a serious scientific journal, writing many of the articles himself, and is credited with helping the entire industry improve its standards and processes. 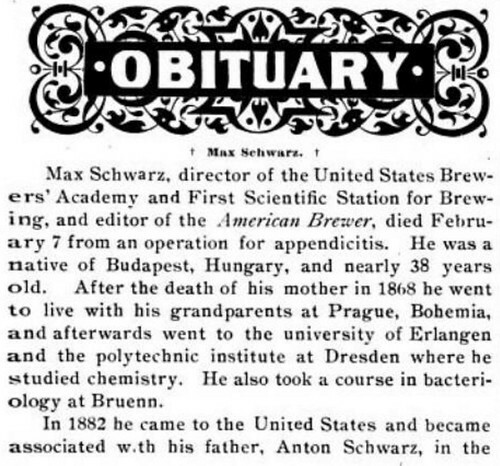 His son Max took over as publisher of the American Brewer when he passed away. 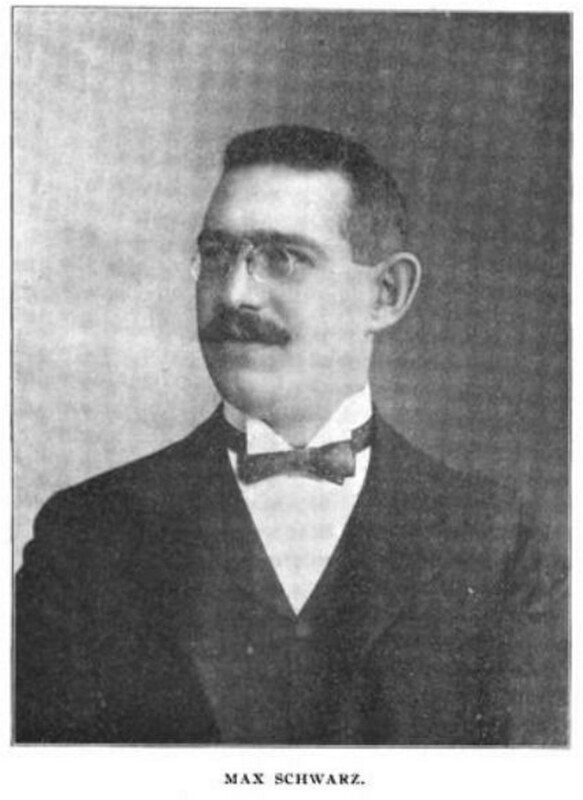 He was also mentioned in his father’s entry in the Jewish Encyclopedia, published in 1906. Today is Garrett Oliver’s 56th birthday. Garrett is the brewmaster at Brooklyn Brewery and has done more for the craft beer industry to promote pairing food and beer than just about any other person alive. 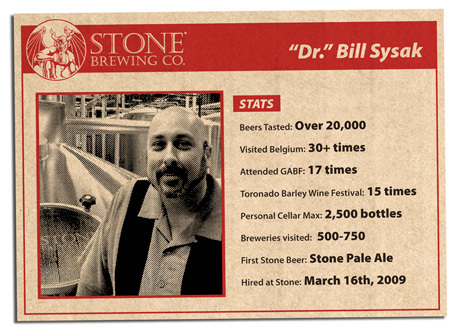 If you haven’t picked up a copy of his book, The Brewmaster’s Table, you should definitely do so. He was also tapped to be the editor of the Oxford Companion to Beer, which came out several years ago (and which I also contributed to). He’s the best-dressed brewer in the world and a great person. Join me in wishing Garrett a very happy birthday. 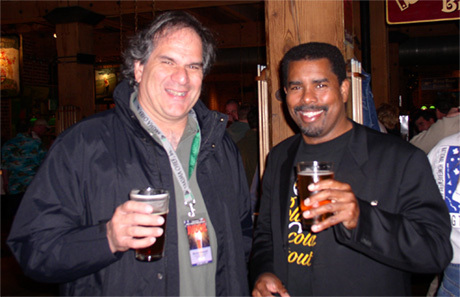 Garrett and Bruce Joseph, from Anchor Brewery, at the Brewer’s Dinner before GABF a few years ago. 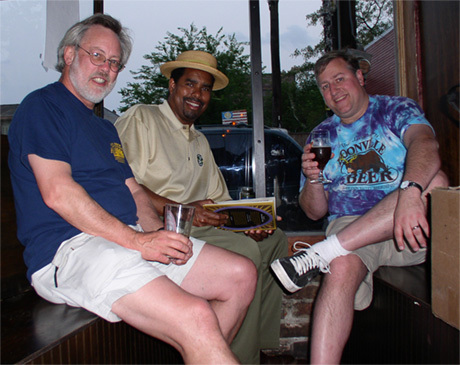 Tom Dalldorf, published of the Celebrator, Garrett and me share a beer at d.b.a. 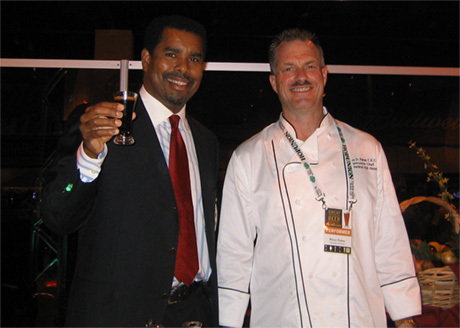 Giving a cooking demonstration with beer chef Bruce Paton at GABF in 2005. 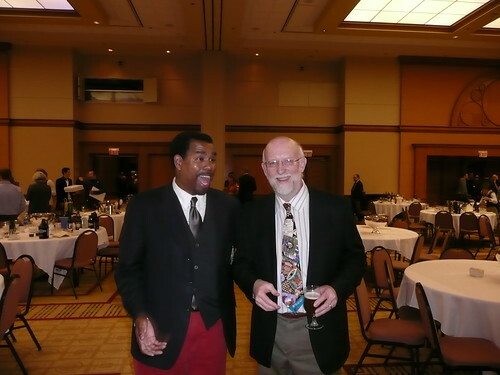 A happy Garrett with Randy Mosher at the World Beer Cup dinner at CBC in Chicago a few years ago. 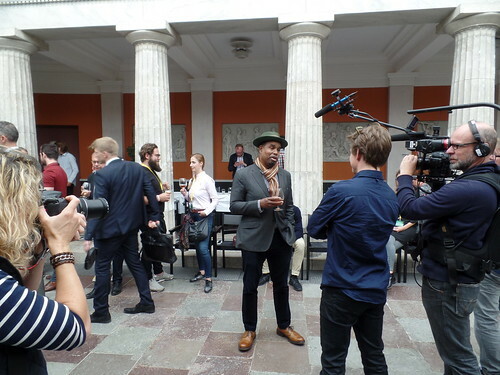 A couple of years ago at Carlsberg in Copenhagen. 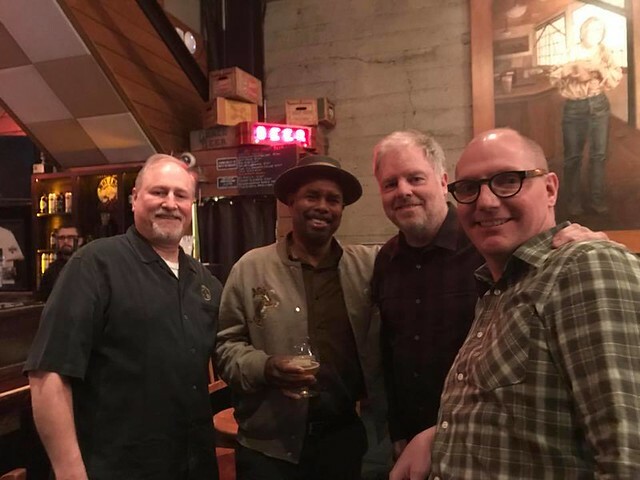 During SF Beer Week 2018, starting the Brew Free! 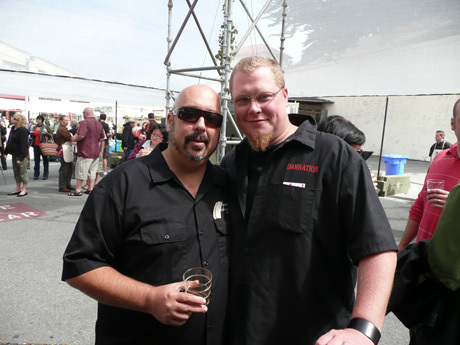 or Dine beer dinner at 21st Amendment Brewpub with Garrett Oliver, Shaun O’Sullivan and Gordon Schuck from Funkwerks. 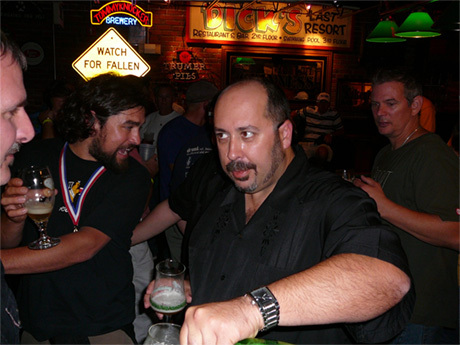 Dancing with Jessica, formerly of the Brewers Association, late one night after GABF in 2004 at Falling Rock.